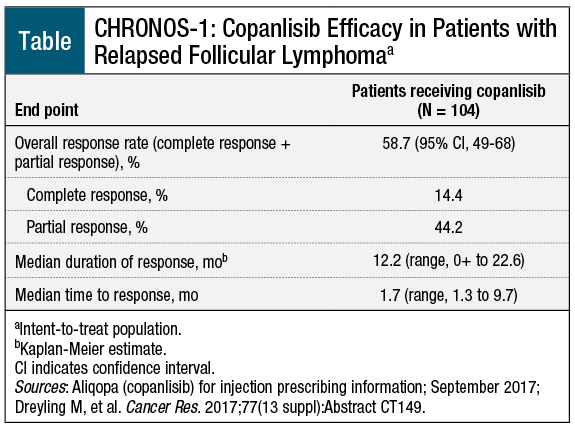 On September 14, 2017, the FDA accelerated the approval of copanlisib (Aliqopa; Bayer HealthCare) for the treatment of adults with relapsed follicular lymphoma who received ≥2 previous systemic therapies.9,10 It is the first intravenous (IV) PI3K inhibitor approved in the United States. Copanlisib, an IV therapy that inhibits PI3K, has demonstrated safety and efficacy in patients with relapsed follicular lymphoma who received ≥2 previous systemic therapies in the single-arm, phase 2, CHRONOS-1 clinical trial. Copanlisib is the first IV PI3K inhibitor approved in the United States for this condition. Additional studies of copanlisib are underway in patients with relapsed or refractory indolent NHL and in patients with diffuse large B-cell lymphoma. 1. Leukemia & Lymphoma Society. Treatment for indolent NHL subtypes. www.lls.org/lymphoma/non-hodgkin-lymphoma/treatment/treatment-for-indolent­nhl-subtypes. Accessed November 6, 2017. 2. National Comprehensive Cancer Network. NCCN Clinical Practice Guidelines in Oncology (NCCN Guidelines): B-Cell Lymphomas. Version 7.2017. www.nccn.org/professionals/physician_gls/pdf/b-cell.pdf. Accessed November 12, 2017. 3. Barrientos JC. Idelalisib for the treatment of indolent non-Hodgkin lymphoma: a review of its clinical potential. Onco Targets Ther. 2016;9:2945-2953. 4. Casulo C, Byrtek M, Dawson KL, et al. Early relapse of follicular lymphoma after rituximab plus cyclophosphamide, doxorubicin, vincristine, and prednisone defines patients at high risk for death: an analysis from the National LymphoCare Study. J Clin Oncol. 2015;33:2516-2522. Erratum in: J Clin Oncol. 2016;34:1430. 5. National Cancer Institute. FDA approval for idelalisib. July 29, 2014. www.cancer.gov/about-cancer/treatment/drugs/fda-idelalisib. Accessed November 6, 2017. 6. Zydelig (idelalisib) tablets [prescribing information]. Foster City, CA: Gilead Sciences; November 2017. 8. US Food and Drug Administration. FDA approves obinutuzumab for previously untreated follicular lymphoma. November 16, 2017. www.fda.gov/Drugs/InformationOnDrugs/ApprovedDrugs/ucm585660.htm. Accessed January 16, 2018. 9. US Food and Drug Administration. FDA approves new treatment for adults with relapsed follicular lymphoma. September 14, 2017. www.fda.gov/NewsEvents/Newsroom/PressAnnouncements/ucm576129.htm. Accessed December 14, 2017. 10. Aliqopa (copanlisib) for injection [prescribing information]. Whippany, NJ: Bayer HealthCare Pharmaceuticals; September 2017. 11. Dreyling M, Santoro A, Mollica L, et al. Copanlisib in patients with relapsed or refractory indolent B-cell lymphoma: primary results of the pivotal Chronos-1 study. Cancer Res. 2017;77(13 suppl):Abstract CT149. 12. ClinicalTrials.gov. Open-label, uncontrolled phase II trial of intravenous PI3K inhibitor BAY80-6946 in patients with relapsed, indolent or aggressive non-Hodgkin’s lymphomas. www.clinicaltrials.gov/ct2/show/NCT01660451?term=chronos-1&recrs=abdeh&rank=1. Accessed November 12, 2017.